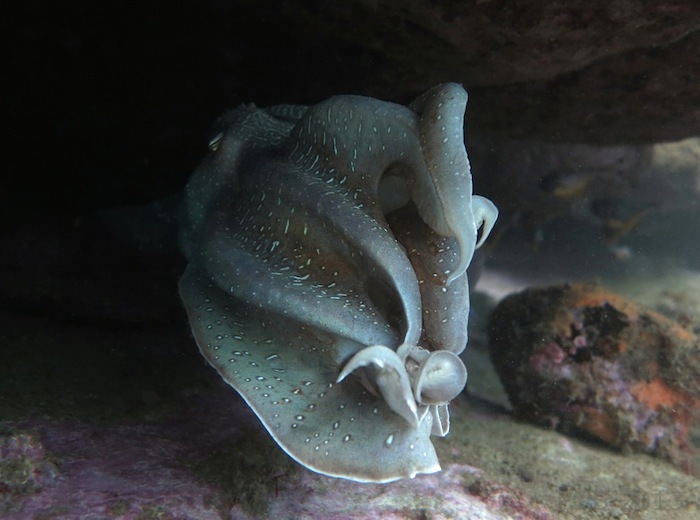 The photos in this post were taken in December, when I came across a Giant Cuttlefish off the Sydney coast in a den where I’ve encountered many of the most spectacular animals pictured on this website. 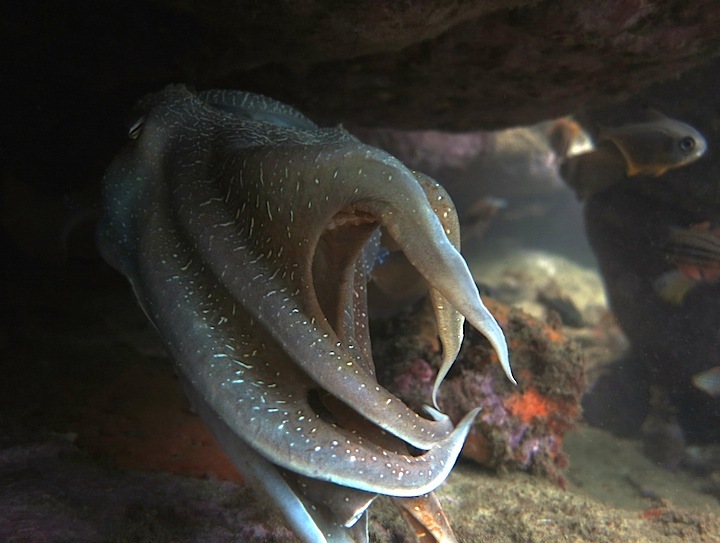 When cuttlefish are common in the area, this seems to be one of the most highly prized dens, a site of contests and expulsions. This individual, large and confident, looked right at home. I spent twenty minutes or so with him, and watched an unfolding series of medusa motions and poses. 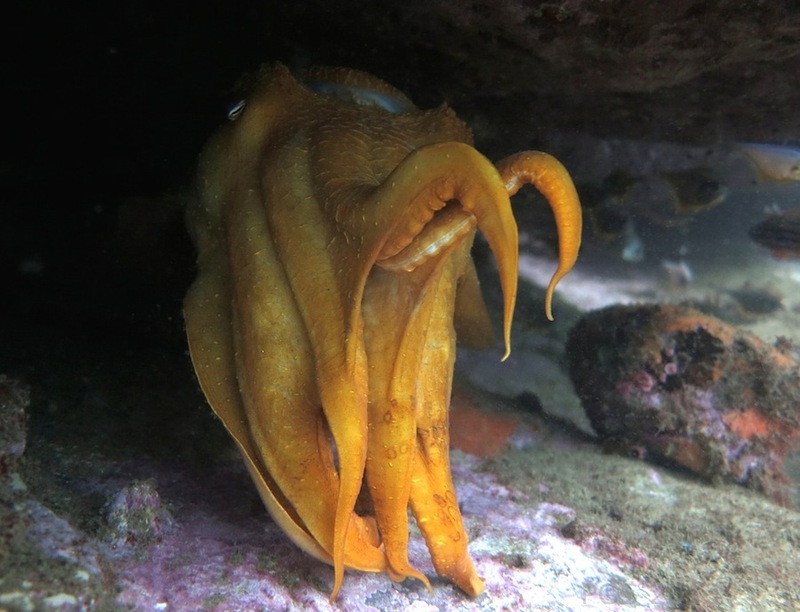 He went through some color changes, including a “yellow flare” – an explosive display where all the yellow chromatophores in the skin are suddenly expanded. The two photos below were taken 4 seconds apart. Some of these displays look aggressive, and the jaws-of-hell position of the arms often seems to be produced in order to shock an intruder. But this animal did not appear to be directing any animosity at me. Instead he just seemed full of vigor and curiosity, and occasional friendliness. I came in and reached out a hand, and twice he touched it gently with his own arm. Eventually I went away for a while, came back, and found him entirely quiet. 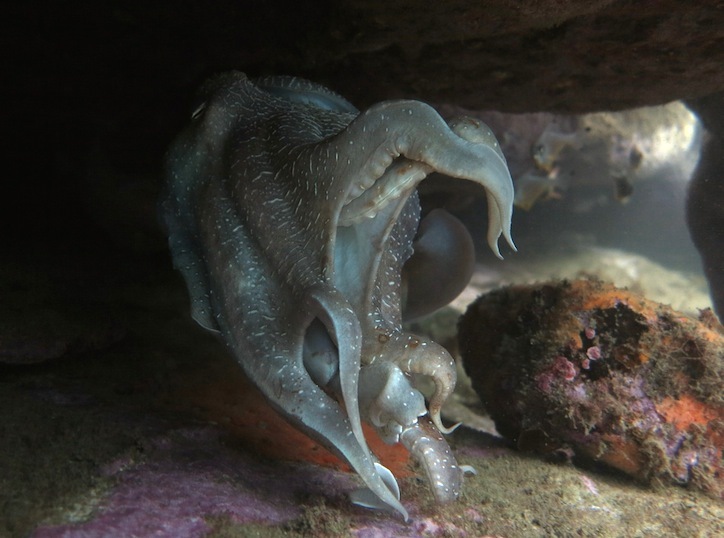 This is the last post on The Giant Cuttlefish. I’m moving across to another website, Metazoan.net. 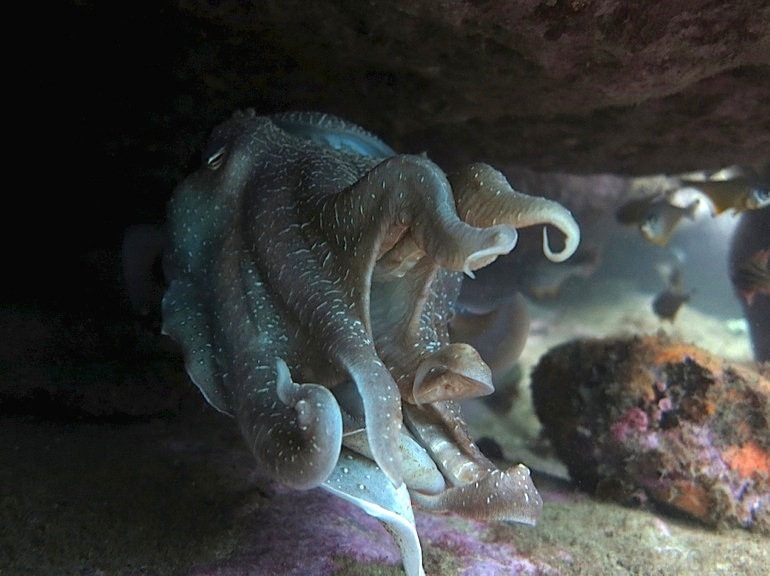 The themes there will be similar, with plenty of cephalopods, but more emphasis on the early history of animal life and behavior. So the wild-armed cuttlefish of this post signs us off. I won’t transfer subscriptions across to Metazoan.net, but will let people decide afresh whether to subscribe to the new site. I am sad to learn this will be the last post. 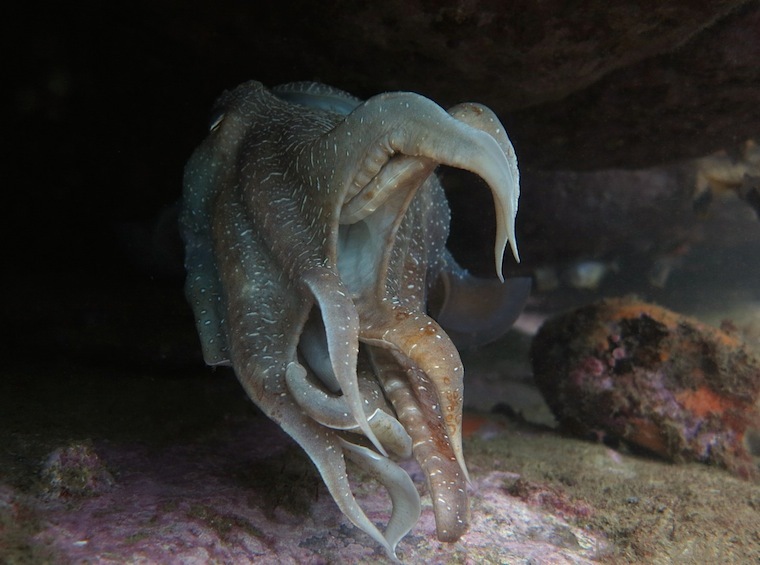 Your thoughtful, philosophical, well-paced blogging is wonderful and I have learned a lot from it, not only about cephalopod minds but also about how to approach my own blog. I just went to your blog – ecomingafoundation.wordpress.com. Great stuff. The volcano photos are amazing. Thanks for looking! And good luck with your new site. 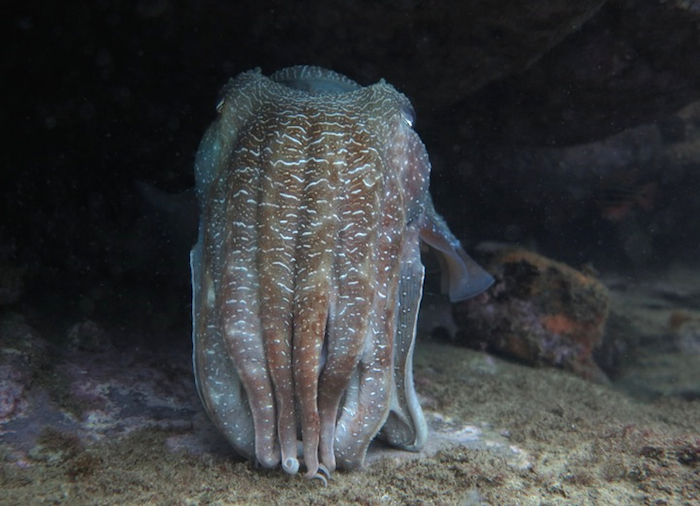 I am sorry to see this blog go; I am a fan of squids, cuttlefish, and octopus. Your writing and pictures are always a treat. I have subscribed to Metazoan and look forward to this new venue. Best of luck.